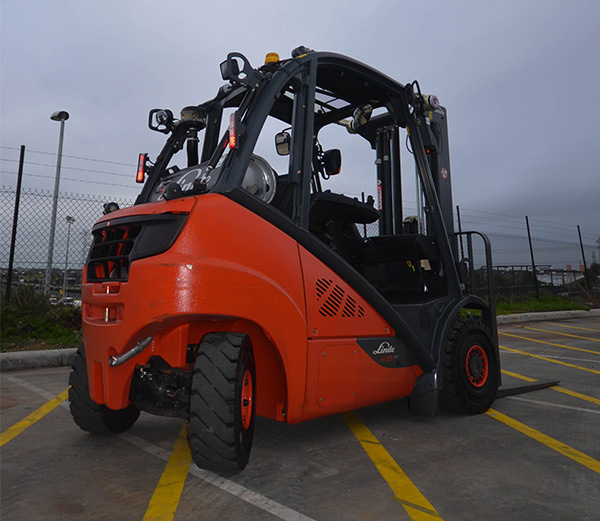 The Linde 39X H25 LPG forklift walks the talk and has the looks. The Linde 39X H25 LPG forklift. From typeface to prototype, Linde is a company that has always sought to differentiate itself from the pack. 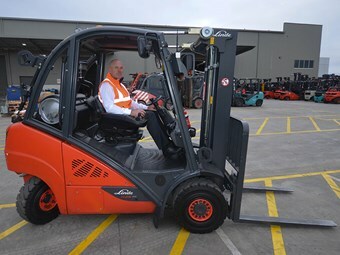 The swoop of the ‘L’ on the body of its flagship 39X forklift mirrors the unique sweeping curve that arcs strikingly from the top of the counterbalance down to the drive wheel. Even at first glance it’s a truck like no other. But it’s not aesthetics that sets this German forklift apart; it’s the revolutionary and much-touted drive system, the hydrostatic transmission. The brochure promised unrivalled smoothness of acceleration and demonstrably faster operation times, due to fewer operator functions, and minimal wear and tear. 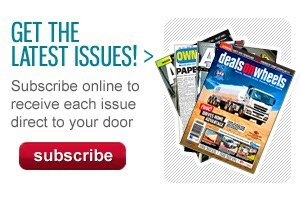 But sales brochures always promise a lot. It was time to jump in the driver’s seat and see first-hand what all the fuss was about. Linde’s hydrostatic transmission is very different to what you find on a conventional forklift that uses a drive train with gears and a clutch. It’s different both in mechanical operation and in feel. The idea is not new, with Linde using the technology since the 1950s. Essentially it’s a closed-loop oil circuit, with power output directly related to the force of the oil flow. The flow of oil is controlled by a swash plate, and the angle of the swash plate determines the direction of oil flow, which in turn drives the wheels either forwards or backwards. What this means is that there are no gears, no differential and no inching pedal; it’s all done through the drive. One of the advantages I can see over a conventional torque converter is that it can be thrown back and forth between forwards and reverse, with no damage occurring to either the tyres or the transmission. Another advantage is step-less acceleration and instant deceleration when required, and exquisite precision, without the need for brakes. No diff means both drive wheels are constantly and evenly powered. As far as lifting hydraulics goes, there’s a significant advantage to this sort of set-up. 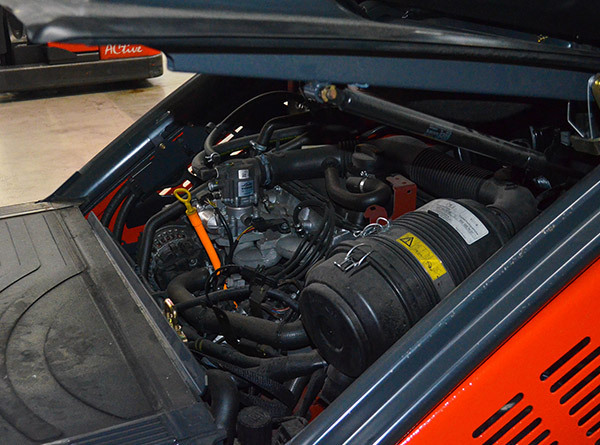 We’re all too familiar with the routine of driving up to a stack and stamping your left foot on the inching pedal to disengage the drive, then hearing the engine rev its guts out as you floor the gas pedal to get some speed into your lift. With the hydrostatic system, lifting hydraulics is powered by a variable displacement pump. This means lifting speed and engine speed are independent of each other. In other words you don’t step on the gas to power the lift — the speed is controlled simply via the force of your fingers on the lifting toggle, with the engine revs remaining constant. The end result: less engine noise and less fuel consumption. A lot less. Customisation is the key, according to Victorian Linde Material Handling retail sales manager, Craig Warren: "The premise of buying a Linde forklift truck is we buy a truck and build it for you. 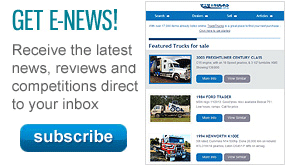 You might have very specific things that you need, and we build you a truck that suits you." 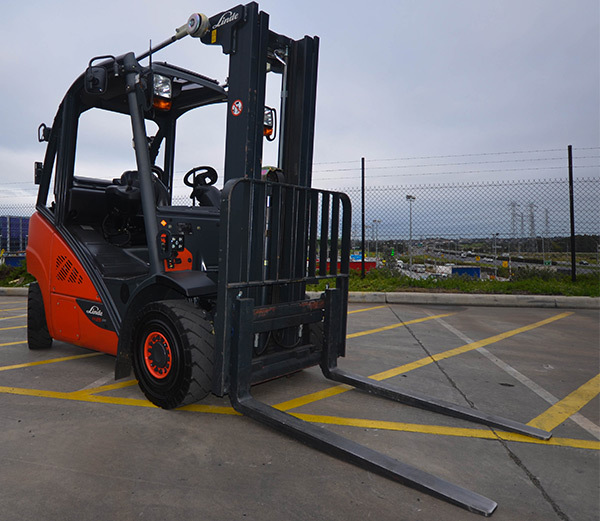 An example on the Linde 39X H25 LPG forklift is the options on forward/reverse operation. You can either choose to have a left and right foot pedal, left for reverse and right for forward. Or you can option a small flick-of-the-switch lever that sits at your fingertips, with forward, neutral and reverse. Different options can also be fitted for the fork-operation controls. Warren says that younger drivers prefer joysticks, while older drivers who aren’t comfortable with changing lifelong habits would rather stick with levers. The model I’m driving is fitted with finger-operated forward/reverse toggle and fork-operation joysticks. Warren must think I look young. Cheers. The seat itself is comfortable enough, with an air-ride rather than a spring-tensioned suspension. You can adjust for your weight easily. The view is relatively good. 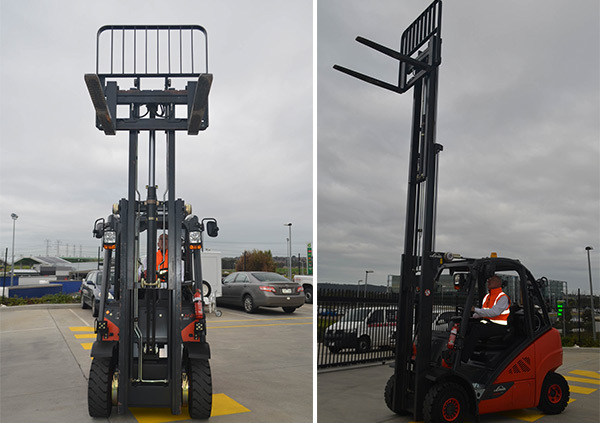 You’re quite high compared to other forklifts, and with a counterweight that sits over and in front of the steer wheels, rather than behind them, rear visibility is good. The truck is designed with a narrow mast, the idea being that you get a better look at your left tine, as it is significantly to the side of the mast, while the right tine slots into your eye line directly between in the middle of the gap in the mast. 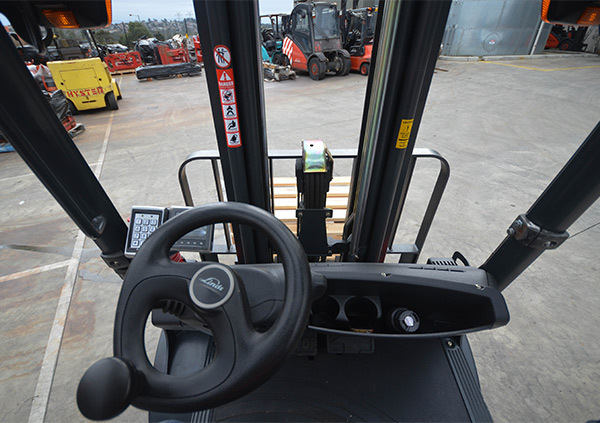 Consequently the seat is positioned slightly to the left, not in the middle as with most forklifts. It could be that I just wasn’t used to it, but I found the heel of the tines difficult to see when they were on the ground, with the dash of the cab obscuring vision somewhat. I would have liked to have had a little more versatility with the steering wheel column placement, as it was a bit high for my liking. Legroom however, is more than generous, and taller drivers will have no issues with space. Start-up sequences are fast-becoming the bane of the impatient driver, and this forklift is no different from others on the market in that you have to jump through a few data-entry hoops before it roars to life. You swipe a card or enter a pin. Then you’re required to go through a digital checklist on the driver’s display before the fun begins. Yes, I have checked the oil. No, there is no damage to the truck. Yes, I would eventually like to drive it … That sort of thing. It’s the future, man. There’s a beautiful, low hum as the engine fires up; quiet and reassuring. The noise will hardly increase throughout operation. You’d almost think you were driving a battery-electric. 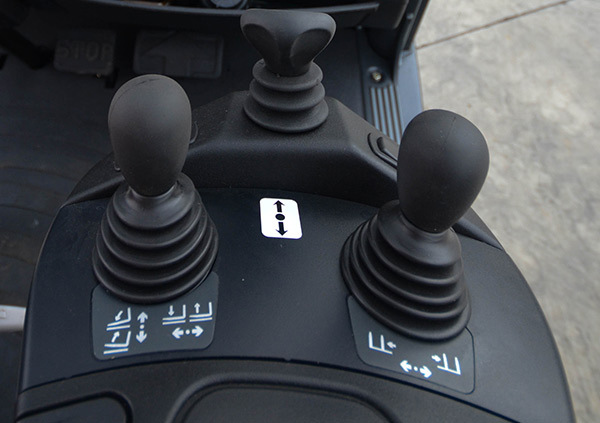 You release a fairly flimsy-looking plastic handbrake lever, flick the toggle forward and accelerate away. Whoa. Now that’s different: instant, super-sensitive response. Never before have the balls of my feet had such control over the motion of a machine. In most forklifts it’s a two-footed drive, a constant back and forth dance of flooring the accelerator until the truck builds speed, then releasing and pumping the brake ... and repeat. You can feather with extraordinary accuracy and be as precise you like. The hydrostatic transmission is more than a transmission, it’s an experience. Warren urges me to floor it down the yard and then chuck it in reverse, while keeping it floored. It’s a hard thing to force yourself to do at first, like bungee jumping: you know it’s safe but something inside you screams, "No". I do as I’m told, and the hydrostatic transmission doesn’t miss a beat. It’s undoubtedly a huge selling point for me. After a bit of practice I was flinging the truck in all directions all over the yard, all by just the flick of a switch. With the brake pedal virtually redundant the 39X, despite feeling alien at first, is actually taking simplicity of operation to a new level. One thing I would have liked is for the handbrake to be automatically activated when the truck comes to a stop, as happens on some electric alternating current (AC) motor models, like the Hyster XN series. Rollback with the Linde is minimal, but still occurs, which means during precision loading on a slope you may need to call the brake pedal into play. This requires your left foot to perform an awkward step around the steering wheel column. The only other minor gripe I had was the unusual position of the horn, on the arm rest. Call me old fashioned but can forklift manufactures please just leave the damned thing in the middle of the steering wheel where it’s instantly on call? Fork operation also takes some getting used to. The left joystick performs both raise/lower and tilt functions, meaning you can raise and tilt at the same time. As with the accelerator the hydraulics work with step-less speed and the control you have over the function is quite remarkable. You push the joystick left for raise and right for lower. Or was it the other way round? I always got it wrong. I asked Warren how long it generally takes a new operator to become proficient at using this hydrostatic system. He said it is usually about a day and a half, but I think that’s generous. After 20 minutes or so I felt I was confident enough to take on the unloading of the semi-trailer that sat awaiting attention in the yard. Warren may have had different ideas though and the invitation wasn’t forthcoming. While the unique transmission is undoubtedly the star of the show, there are other newsworthy features that should be mentioned. The tilt function is operated via overhead tilt cylinders that protrude from the overhead guard, which adds to the Lego Technic look of the truck, but also makes a whole lot of sense mechanically. Tilting at height has always caused me concern, as forklift masts at full stretch have a tendency to sway like uncle Barry after leaving the pub on a Friday night. It doesn’t take an engineer to work out that better stability is achieved by placing the cylinders higher up the mast. 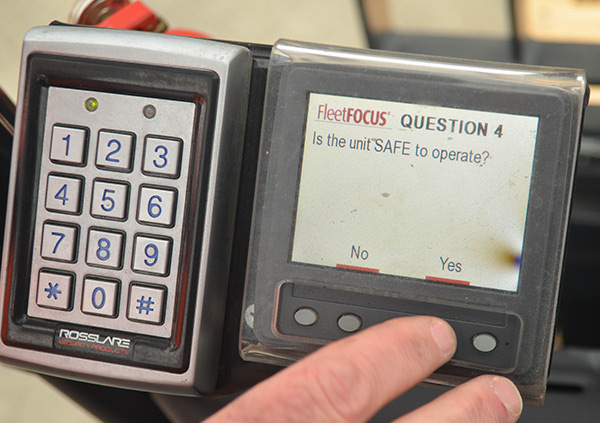 It’s a big tick for operator confidence and safety. Safety is addressed further with the rather sci-fi BlueSpot — a beam of blue light that shines from the overhead guard to the floor, a few metres behind the truck. BlueSpot is automatically activated when reversing, and the idea is pedestrians receive warning that the truck is reversing out between aisles and into a thoroughfare. Fancy. Under the hood the 39X boasts critical self-preserving features such as an engine protection system, which monitors key parameters and will switch the truck to creep mode if for some reason things go really bad, which in all likelihood they won’t. This is a machine built to the highest standards. Warren is realistic about the sales pitch with the Linde 39X. Yes, it’s going to cost you more upfront, but when you look at the long-term picture you’ll find the savings come pouring in: a minimum 30 per cent less fuel use; quality materials; 1,000 hours between services — not that there’s much to service anyway; tyres that won’t wear out in a hurry; and perhaps most importantly, the quickest and most efficient performance in the yard you could hope to find. More work done in less time, and a happier, more productive operator. Linde worked out a good system a long time ago, and has continued to refine it to the point where it is deservedly one of the big players today. With more than 500 machines sold in Australia in May alone, across an incredibly broad range, customers seem to be responding with a big ‘thumbs up’. The Linde 39X H25 LPG forklift is not quite a perfect machine. But it’s not far off.